Jared graduated from Brigham Young University with a degree in Political Science in 2001. After graduating from Brigham Young University, Jared spent two years working in Washington D.C. for the U.S. Senate Energy Committee. In 2006 Jared graduated with his Juris Doctorate from Gonzaga University School of Law. Upon graduating he clerked for the Honorable Monte Carlson in the 5th Judicial District in the state of Idaho. Jared then went to work for the City of Boise where he worked as a prosecutor and tried numerous of jury trials. Jared’s practice focuses on civil litigation, business law, employment law, and criminal law. 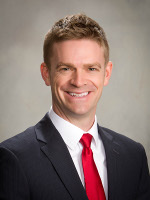 He is licensed to practice law in Idaho and in Utah. Jared speaks fluent Spanish. Copyright MHM Law Offices 2019.